A Trigger allows you as the administrator to receive automated notifications from Nest Forms when a response or responses have been received to your account. 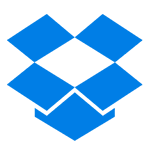 This can be by email or as even updates and additions to some of the popular third party cloud platforms (Google Drive, Dropbox). Some of the Trigger features described below are only available based on the subscription package you have chosen, this is explained in the table towards the end of the help page. Depending on your subscription, you can choose separate trigger types. For instance, you can choose options like receiving a summary email for all responses received during the day. 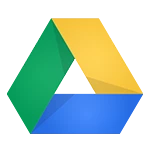 Or you can save a new response into your Google drive account as soon as it is created and many other options. 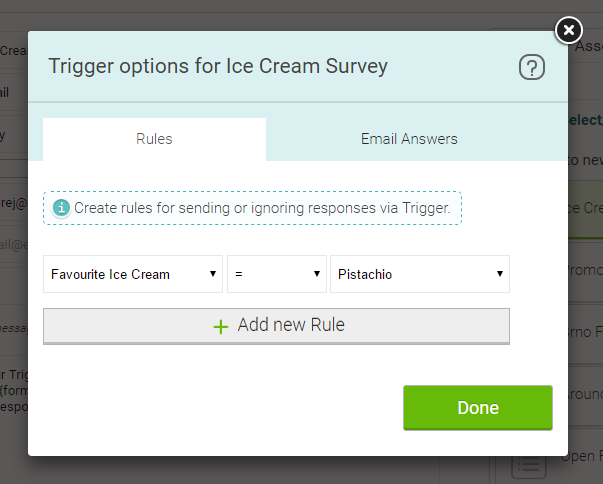 In order to assign a trigger to one of your forms, just click on Triggers in the submenu on your Dashboard. This will bring you to the list main Triggers page, from here you can edit your existing triggers or add your first trigger by clicking on the “Add Trigger” button. You can select which forms your trigger is associated with. You can also easily set all forms by clicking to “Select/Deselect All”. 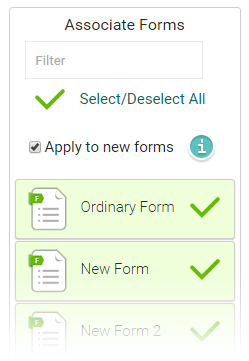 Finally, when you tick the checkbox “Apply to new forms”, any newly created form in your account will be automatically added to this trigger. 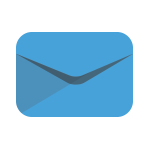 Email: You can choose between Daily, Hourly and instant updates and you will only receive notification emails when there are new responses. Make sure to verify the email address that is going to receive the notifications when setting up your trigger, you will be asked to do this when saving the trigger. There is already a pre-written email message that is sent with the trigger notifications, you can see it when editing your new trigger, but it should cover your needs by default and you should only need to edit this mail if you really need to add some more personalised information into the email. If you want an email to be sent to the user that was entering the data, for example with a final PDF of the collected data, just select the Email to Responder field. This feature is only available within instant triggers for premium subscribers. 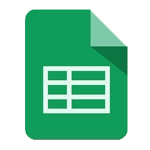 Will automatically sync all new responses with your designated Google spreadsheets account. Please remember that all responses are sent (including pending responses). Please remember that all responses are sent (including pending responses). 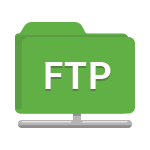 FTP / sFTP - will automatically export all new responses into your private FTP or sFTP account. This will allow you to have a copy of all data you have collected. This can include Word documents, single and multi PDF documents, Excel sheets or all files and images collected by your colleagues. Please remember that all responses are sent (including pending responses). Available to Advanced & Premium users only. Autoapprove - automatically sets the the response to approved (once all the images are submitted). This works as an instant trigger only. Available to Premium users only. Webhook: Informs an external web application to process the data or to perform some additional action. We believe that this will be mostly used as the Instant option when the trigger is automatically called whenever the response reaches the server. It is even possible to join the webhook to the Nest Forms application, so that your website can perform more actions afterwards. The Webhook trigger is only available on the premium plan. For developers, Webhook data is sent via standard HTTP POST. You can review an example received data to see what the below will generate. color_style: The style selected for the branding. We also integrate with Boberdoo using the webhook. For advanced and Premium users, we also provide triggers to send your data to the following storage options. When you want to use the trigger for any of the options below, just try the first export manually (on the reports page). This will then setup a communication with your third party provider. Then there are no special settings needed in triggers if you create one later. Daily - The most often used trigger - you can just get a notification on how many forms were filled during the previous day (Available to all paid subscriptions). You can specify the exact time you prefer the trigger to run. Hourly - Similar notification to daily, except it is sent on the hour. Which allows you to review these responses within the same day if required (Available to Advanced & Premium users only). Instant - You receive one notification per response to your form in real time (Available to Premium users). Select the question, then set the condition and the value. There are many different filter conditions that you can apply. Some examples are: empty, not empty, equal and not equal. For text questions you can also use the filter contains text. For dropdowns, single answer, multiple answer components, you can choose the values from the dropdown. For numbers, you can also compare by greater than and lower than. You can easily add an additional question by clicking to Add new Rule. 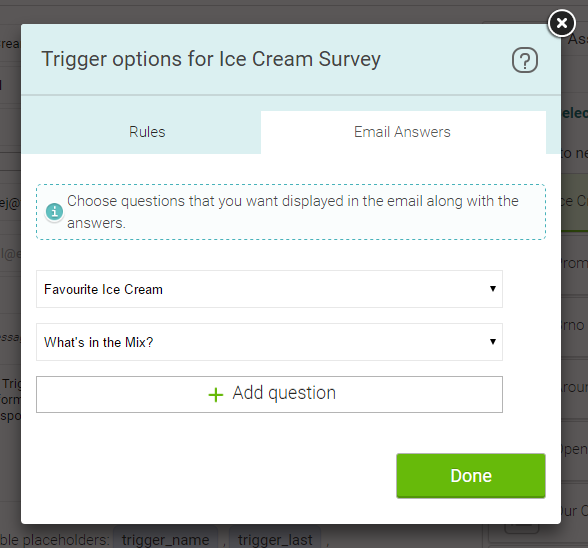 When you have multiple questions, you can specify whether the trigger will be sent when any or at least one of the rules is met. When you are receiving trigger emails and you want to see certain answers directly in the email content, you can specify the answers in the “Email answers“ tab. Just choose the form on the right hand side, then mouseover, click on the lightning icon and click to the second tab called “Email Answers”. Here you can specify which answers you want to to display directly in the content of the email. Free - No Triggers available. Standard - Allows daily, weekly, fortnightly & monthly triggers including standard exports. Advanced - Allows the email advanced export options + Google drive, Google sheets, Dropbox, also allows for hourly triggers. Premium - allows the use of webhooks, autoapprove and instant triggers.